Due to things that have been happening in my life, I haven’t posted an update on the performance of my ETF tactical asset allocation strategy in far too long. The wait is over! As practically every major investment asset class lost value in 2018, so too did my strategy as it lost 6.94%. 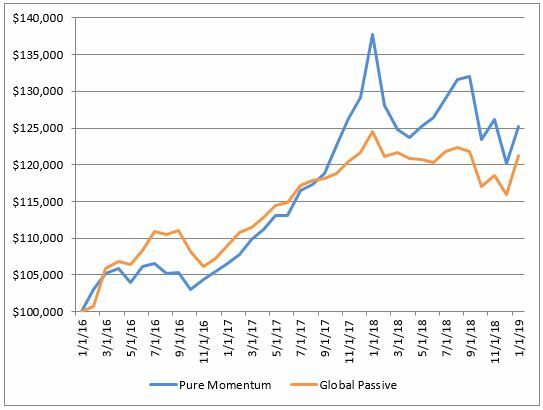 If there is any good news it is that much of that loss has been recouped already in 2019 and my strategy is still ahead of a passive global strategy in terms of total return. The CAGR of my ETF asset allocation system that I have been publishing on this site currently sits at 7.9%. 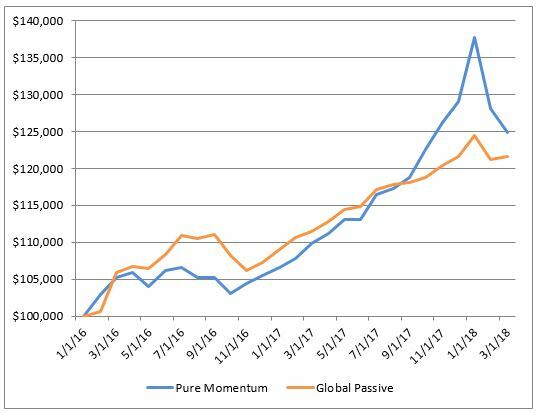 As seen in the chart above, that is higher than I would have achieved with a global passive ETF portfolio but, I have to say, it is lower than I would like to see. I am always searching for any tweak that I can make to improve my strategy’s performance and, as noted later, I have made a recent change which involves levered ETF’s (2X) when conditions are deemed to be right. Even though I believe that a Gain to Pain ratio requires a minimum of five years of history to be valid, I track the ratio for my strategy understanding the limitations of calculating it for a short period of time. The performance of my strategy in 2018 has resulted in a lower GTP ratio than I would like. We’ll see if it rises throughout 2019. If you have an interest in developing your own ETF asset allocation strategy you can’t go wrong reading this post over at TrendXplorer. 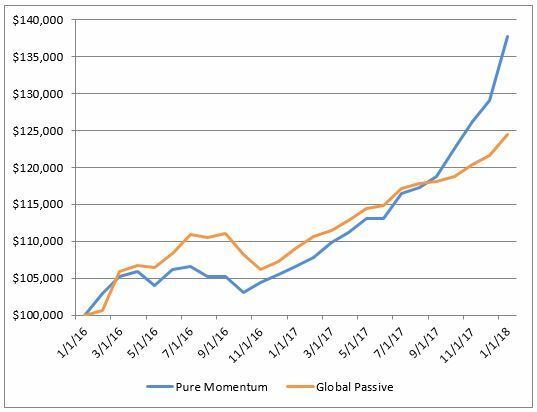 I have incorporated some of the research from that post into my strategy and expect to see improved returns going forward. The purpose of this site is for me to hold myself accountable for my investing performance. The easy thing to do would be to not show my strategy performance and tell friends about the trades that worked out well while not mentioning the losers. If you are reading this and want to become a better investor/trader I encourage you to post your results. You may have heard the saying about one of the best ways to accomplish a goal such as losing weight or quitting smoking is to publicly announce your goal. The thought is you will then have peer pressure working on you as your friends and family will be watching to see if you accomplish your goal. I see this site in a similar way. The cure for poor performance is poor performance (not always but sometimes). If I see that my investment performance is lacking then it is up to me and nobody else to take action. Outcomes. 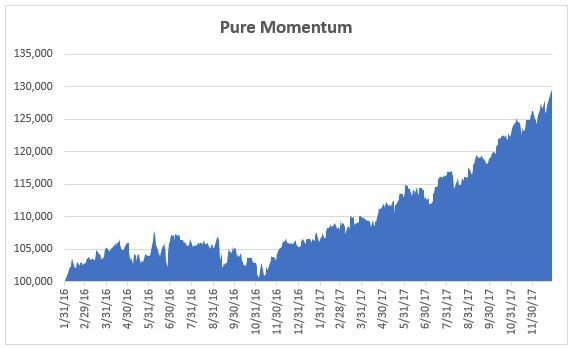 When you are a long-only investor and the markets behave like they did in 2017 it is easy to focus on outcomes and tend to allow your mind to diminish the importance of process. 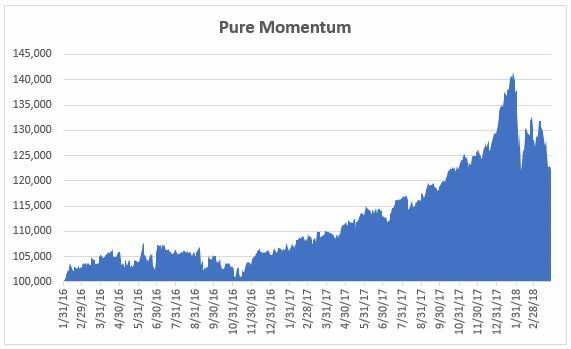 When your equity chart increases every month for twelve months straight you have full confidence in your process because the outcomes are so darn favorable. Then February 2018 hits you. The outcomes that your brain has become accustomed to change dramatically and your focus switches to process. Every day the financial media reminds you that volatility has returned with a vengeance like you haven’t experienced in so long that you forgot what it feels like. This is very unpleasant. Gut-wrenching even. Suddenly there is a voice in your mind screaming that there must be something wildly amiss with your process. Process. 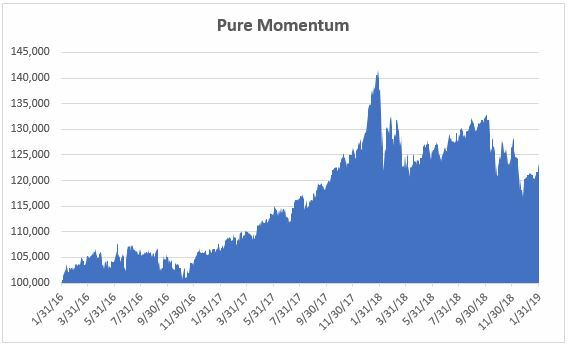 It is far more important than outcome and it is what we, as investors, should be focusing on but why would we when we produced positive returns every single month in 2017. Our investing process must have been sound given how smooth and upward sloping our equity curve was last year. Doubts. If you have them about your process there is nothing quite like a spike in volatility and a swift drawdown to make you question whether your investing strategy is in dire need of an update. New rules perhaps. Tighter stop losses would have worked so well this month. Buying cheaply priced puts in January now seems like such an obvious move that you should have made. Relax. If you have a sound strategy that has proven itself over time then now should be no different and you must ignore the alarms from the financial media and relax. Now is not a time to jump ship and abandon your strategy. Surely you have read about the gains you would have enjoyed had you bought stocks in Berkshire Hathaway and Apple decades ago and just held. I suspect you also understand that you would have had to endure many drawdowns in excess of 40% between then and now. What we are experiencing lately is child’s play compared to those drawdowns. My advice is to stay the course (assuming that your course is a systematic investing strategy that suits you and will provide you with returns and drawdowns that are acceptable), don’t pay attention to the alarmist headlines in the media, and if you are in the accumulation phase of your investing plan continue to contribute each month. Last month felt like one for the record books. Broad equity indices rose without resistance throughout the month as if all was well with the world. The markets fell a little at the very end of January but even with that decline, my tactical asset allocation strategy which uses ETF’s rose 6.69%. Volatility remains on the low side but did increase and is pushing the limit for me to be prepared to reduce leverage. Currently, I am using 30% leverage and have been doing so for some time. Interest rates are low and volatility, until now, has been low so it has been an opportune occasion to use margin. It is at times like this when my equity chart moves ever so continuously higher that I remind myself to not confuse a bull market with brains. Conditions have been exceptional for a tactical asset allocation strategy such as mine and I used margin responsibly and it paid off. Let’s keep in mind that we, as investors, should focus on process over outcome. 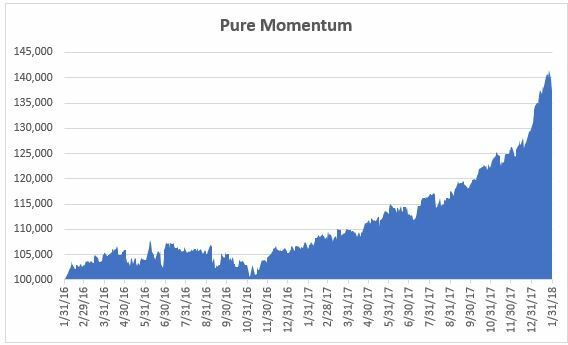 Every month I report the outcome but it is the underlying investing process that is truly important. By now you know that the US equity markets, in particular, had a solid 2017. My ETF investment strategy selects five or six ETFs at the end of each month and holds them until the end of the following month when selections are made again.It should be no surprise that my tactical asset allocation style of investing had me hold SPY every month throughout 2017. Volatility was historically low last year. 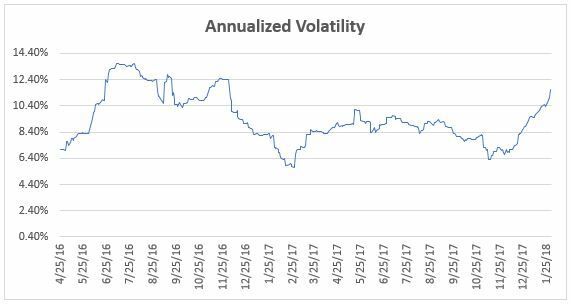 On average, I used 30% leverage in 2017 but the annualized volatility of my ETF portfolio was almost always below 10%. I have been asked about my expectations regarding which markets will be the 2018 winners. My style of investing is based, in part, on an understanding that I as an investor do not make predictions. Yes, I can tell you which asset classes are represented in my holdings right now but I can’t tell you how long I will have them. Nor can I make any sort of educated guess regarding how my portfolio will fare overall in 2018. As I alluded to in earlier posts, I consider monthly returns analogous to picking green and red marbles from a bag while blindfolded. My strategy determines if there are more green marbles (positive monthly returns) than red marbles (negative monthly returns) but I have no say in the order the marbles will be picked. December’s performance was yet another green marble as my portfolio grew by 2.29% giving an overall gain for 2017 of 22.4%. 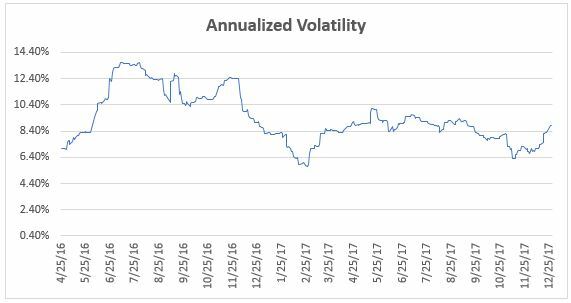 The amazing characteristic of 2017 was the low volatility. If you look at my equity chart below you will see how incredibly smooth it was last year. My Gain to Pain Ratio is an absurdly high 4.96 due to it being measured over just under two years when the markets have provided solid returns. In the long run, I expect this ratio to lower to between 1.5 and 2.0. My five ETF holdings for January cover US equities, Asian equities, and energy.